(Norcross, Ga., 31 July 2007) – The California Department of Forestry and Fire Protection (CAL FIRE) has selected the Leica ScanStation 3D laser scanner from Leica Geosystems to support fire investigations on its over 31 million acres of responsibility. Developed for versatility and productivity, the Leica ScanStation provides investigators with a powerful tool for fire scene reconstruction by enabling the rapid collection of millions of high accuracy measurements at the scene. The 3D scan data can then be used to analyze the pre-fire spatial relationships and geometry between trees, branches, terrain, structures and nearby utilities. The ScanStation is a highly mobile laser scanner platform that is uniquely suited to the speed, accuracy and mobility requirements of a fire services organization. CAL FIRE’s first introduction to the benefits of 3D laser scanning emerged in the aftermath of a fire several years ago that started when a dead tree fell on a power line. When questions arose as to how the fire started, CAL FIRE called in a local laser scanning consultant to map the area. Using data from a Leica Geosystems laser scanner, the agency was able to show that due to insufficient forest maintenance in the vicinity of power lines, a utility company was responsible for the subsequent fire. The detailed fire scene reconstruction enabled by the Leica Geosystems laser scanner was instrumental in helping CAL FIRE recover over $10 million in fire suppression costs. Since this first application, CAL FIRE has used laser scanning technology to investigate a number of fire scenes throughout the state of California. Once the 3D scan data is collected, fire investigators can virtually revisit the scene at any time to make additional measurements as the scope of their investigation changes. The digital data can also be imported into CAD or specialized software to create a physical model, rendering or even virtual animations. Tony Grissim, Public Safety and Forensic Account Manager for Leica Geosystems, summarizes, “Fire scene reconstruction is a growing application area for our scanners as both attorneys and insurance companies come to realize the compelling nature of scan data collected by fire investigators. The findings from investigations like these can mean the difference between millions of dollars in pay outs or, in some cases, people going to prison. Modesto Fire Capt. Matt Curless and firefighter Ryan Viss are trained to wait for a second team of firefighters to arrive before they charge into a burning building. The backup team is supposed to be on the scene just in case Curless and Viss are trapped and need help to get out. But they can disregard that safety rule when they are told someone's life is in danger, Curless said. That's what happened Wednesday afternoon at 2429 Roble Ave., just east of El Vista Avenue in east Modesto. Curless and Viss pulled out wheelchair-bound Joyce Evans, 73, and her son, Wayne Michael Evans, 49, from their burning home. After being told a fourth family member, an adult daughter, was still in the house, the firefighters rushed back against intense flames and thick smoke. After a complete search, and beaten back twice by intense heat, they left the house to find out that the daughter was down the street. "The adrenaline goes up quite a bit, but you rely on your training and you go in," Curless said. Neither firefighter was injured. Family members suffered moderate injuries. Dana Evans, 38, said the fire caught the family off-guard when a fan extension cord ignited a small flame that quickly spread to the wall and the bedsheets in his brother's bedroom in the back of the house. Dana Evans cares for his brother, sister and his mother, who are developmentally handicapped, he said. He was asleep in his bedroom when he heard his mother screaming. He got up to find his brother trying to extinguish the fire with a bucket of water. The flames climbed the walls to the ceiling and nearly trapped the brothers. "It tried to box us in," Dana Evans said. "The fire was behind us now. I just said, 'get out, get out.' "
His mom and brother refused to leave immediately, and it was several minutes before he called firefighters. "It's everything they own; they don't want to leave," Dana Evans said. He said his mother weighs about 290 pounds and is confined to a wheelchair. It was stuck and blocking the hallway as the flames continued to spread. In a desperate attempt to get his mother out, Dana Evans pushed her out of the wheelchair and tried to drag her out, but got only as far as the front door. He then ran outside to the back to look for his sister, but he couldn't find her. He returned to the front to meet firefighters, who arrived within three minutes of the call. Viss ran inside to get Joyce Evans, who was crawling to get out. He and Curless pulled her to the lawn and returned to get Wayne Evans, who was trying to put out the flames with a garden hose. He was surrounded by smoke. All Curless and Viss could see was Wayne Evans' two legs below the smoke. "He was really doing more harm to himself than anything else," said Modesto Fire Battalion Chief Sean Slamon. When Viss and Curless rushed back in to look for the daughter, heavy flames met them in the hallway. At waist level, the fire reached temperatures of about 1,000 degrees, and the heat in the ceiling was closer to 2,000 degrees, Curless said. The heat pushed back the firefighters twice before other firefighters cut holes in the roof to lift the smoke and relieve the heat. "Frankly, we got our butts kicked a little bit," Curless said. Curless and Viss were able to search all three bedrooms using a thermal-imaging camera. A second team of firefighters conducted a secondary, more thorough, search and did not find anyone. "We were pretty confident nobody was inside," Curless said. Said Dana Evans about his sister's early escape: "Apparently, she was the smart one." The fire collapsed a backyard patio and gutted the home. It caused an estimated $150,000 in damage, Slamon said. Wayne Evans and his mother suffered smoke inhalation and were taken to nearby hospitals. He also suffered burns to his hands and some singed hair. They were released Wednesday night. Red Cross officials provided the family with a temporary place to stay and some clothing. "We have nothing," Dana Evans said. "Everything is burned." To comment, click on the link with this story at www.modbee.com. Bee staff writer Rosalio Ahumada can be reached at rahumada@modbee.com or 578-2394. • Always include SAFETY in your actions; making it your number one priority! • Live fuel moisture samples across the state, and especially in Southern California, have been the lowest sampled in history. Critical fuel moisture will be reached at least two months early in most areas. The heat sink properties that live fuel moisture usually provide will be absent this season. Assume live fuels are fully available to burn. Low live fuel moistures and heavier than normal dead fuel accumulations under stressed vegetation will cause explosive fire behavior. • Weather conditions were unusually dry this spring with historically low rainfall and mountain snow pack over the entire state. Soil moisture is exceedingly low and large dead fuels are fully cured. Fuel beds will support rapid ignition, heavy spotting, & high intensity fire spread. • Energy Release Component (ERC) values are above the 90th percentile in all areas, and above the 97th percentile in the most critical areas of the state. The 97th percentile indicates that only 3% of observations have ever been recorded above that level; in other words, the ERC values currently being recorded in most areas of the state are at historical highs. Remember, the ERC calculation is dominated by fuels and does not consider wind or topography and typically trends better than other NFDRS Indices. • Topography plays a significant role in fire intensity through slope, aspect, and channeling. Watch for the daily changes in sun exposure over the various aspects and consider topographic channeling or alignment when evaluating your position. Gather intelligence and remember the fundamentals – emphasize and implement LCES prior to engagement! Develop situational awareness of the critical conditions described above. Use your experience or ask the locals what situations cause the greatest difficulty. How’s it burning? If your gut makes you anxious, there is probably a good reason! Re-evaluate your situation and act accordingly. Clear and concise communication must be maintained. Evaluate conditions continuously. Monitor fire weather conditions throughout your commitment. Pay attention to how internal and external distractions affect your risk-decisions. Focus on the Big Picture, not the narrow view immediately in front of you. You are empowered to make risk-decisions based on current and expected conditions and your evaluation of probability of success. When considering structure protection, ask yourself, "Is the structure defendable and would you be there if the structure was not?" Do not attempt a frontal assault on a fast moving fire. Existing conditions warrant a "back to the basics" approach to safely mitigate incidents; anchor and flank, one foot in the black, valid safety zones and escape routes. Once you figure all these things out, communicate them to all concerned and make sure someone is acting as a knowledgeable and capable lookout. DO NOT OVER COMMIT! THE FIRST PRIORITY FOR ALL DECISIONS IS FIREFIGHTER SURVIVAL. As of 9 a.m. on July 31 there are no major state or local incidents. CAL FIRE is assisting federal firefighting agencies throughout California. This fire has burned 33,500 acres and is now 60 percent contained. The Zaca Fire started on July 4 and is burning in steep and rocky terrain. Low humidity and winds resulted in extreme fire behavior yesterday within the Los Padres National Forest wilderness area. Weather conditions are predicted to be relatively the same throughout the week. An evacuation order has been issued for the Community of Peachtree. For the most current evacuation information contact the Zaca Fire Information Center at (805) 961-5770. Over 1,000 firefighters are assigned to this fire. The fire is under a unified command with Santa Barbara County Fire and the US Forest Service. The full containment date is estimated to be September 7. This fire has burned 12,656 acres and is 77 percent contained. Of the 30 identified fires in the Elk Complex, 25 are now 100 percent contained. The fires will continue to be monitored, patrolled and staffed as safety, resources and access permit. Over 900 firefighters are assigned to the complex. The complex is expected to be fully contained on August 5. Abundant monsoonal moisture across Nevada will slowly edge westwards towards California today. A weak upper level low off the Central Coast will help shift southwest winds to a more southeast direction by this evening into Wednesday. This should be enough for thunderstorms to form along the Sierra Crest and move further north and northwest into the Northern Sierra area. Isolated thunderstorms, mainly dry are possible this evening near the Tahoe Basin. On Wednesday, a larger scale monsoonal push of moisture will let up with a more widespread thunderstorm threat both wet and dry. Thunderstorm activity could linger into Thursday across the area, but would be mainly wet with locally heavy rain in some spots. A ridge of high pressure centered over the Four Corners Area will maintain near normal temperatures over the region through Friday. A Pacific trough will move over the West Coast bringing cooler temperatures Saturday through early next week. Humidity will be low across most of the region through early next week. Isolated to scattered showers and thunderstorms will continue over the Eastern Deserts through early next week. 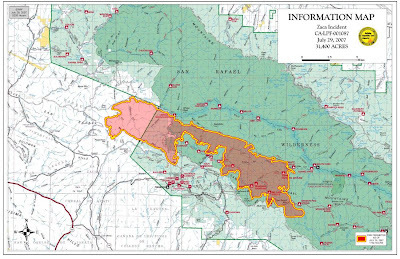 InciWeb: Elk Complex Wildland Fire - 13,656 acres - 77% containment. Expect an increase in containment as direct strategy and burnout continues. Today, crews will continue burning with the assistance of aerial resources. Crews continue to secure established fireline. Patrol and mop up the Little Grider Fire will continue. There will be a community meeting at the Happy Camp Grange on Tuesday July 31, 2007 at 7:00 p.m. Presentations include updates from the Happy Camp District Ranger and the Elk Complex Incident Commander. Wingate/Titus/King Creek 2 Fires (8,420 acres) 36% contained. Firelines have been constructed and burnouts continue. A recommended evacuation for homeowners and closure for campers and miners, from Five Mile Bridge to Norcross Campground on Elk Creek Road remains in place. Elk Fire (1,144 acres) 96% contained. Hummingbird Fire (80 acres) 0% contained. The fire remains in aerial patrol. Sources of info include: http://www.inciweb.org/ (including other fires) or the incident information office at (530) 841-4451. Visit http://www.fs.fed.us/r5/klamath/condition/ for information on fire restrictions and local closures. The Siskiyou County Air Pollution Control District has installed an air quality monitoring station in Happy Camp. Real-time data may be viewed online at http://www.satguard.com/usfs/Chart_new.asp?Get=4&UnitID=36&CustID=2&sDate=7/29/2007. Mature heavy timber overstory with brush understory, large quantities of dead fuels and snags. Slow moving surface fire with short runs on aligned slopes with isolated torching, creeping and roll-out on steep slopes, during the night. Continued to secure line burned on previous days. Patrolled and mop-up. Assess opportunities to apply interior aerial ignitions on the Western portion of the fire. Evaluate further burn operations on the Wingate/Titus/King Creek 2 fire. Secure the line burned on previous days. 12 hours: Continued spread expected due to further drying of fuels and potential burnout/backfire operations. 24 hours: Potential for re-burn in areas wetted by previous rain event as drying continues. Short range spotting activity could increase fire spread. 48 hours: Potential for re-burn in areas wetted by previous rain event as drying continues. Short range spotting activity could increase fire spread. 72 hours: Potential for re-burn in areas wetted by previous rain event as drying continues. Short range spotting activity could increase fire spread. Likely to meet objectives based on current weather projections. Expect an increase in containment as direct strategy and burnout continues. A total of seventy-seven miles of fireline has been constructed to date. This includes twenty-eight miles of dozer line and forty-nine miles of handline and brushed roads. A six mile portion of the Klamath River will be used as a west flank containment line for the Wingate/Titus/KingCreek2 fires. Fire acreage and containment: of the thirty identified fires in the Elk Complex, 25 fires are 100% contained. The remaining fires are as follows: King Creek 2/Wingate/ Titus 8,420 acres-64%(increase in acreage due to burn operations); Elk 1,144 acres-96%; Hummingbird 80 acres-0%. Elk fire and Hummingbird fire is in aerial patrol. An additional $773,000 was added into the cost to reflect mobilization and demobilization of 3329 personnel from 7/14-7/30. An EVACUATION ORDER has been issued for the Peachtree Community. An EVACUATION WARNING has been issued for Happy Canyon Road up to Baseline Avenue. With the current warming and drying trend, active burning continued throughout the night in the uncontained, southeast area of the fire. Approximately 1000 acres burned in a southeast direction since yesterday with areas burning out of the San Rafael Wilderness, including two spot fires. The relative humidity recovery overnight was very minimal, only reaching into the mid twenties. Active burning is predicted to continue today, as single digit relative humidities and temperatures into the mid 90s prevail in the fire area. Columns and drift smoke are likely to be seen throughout the Central Coast. While the fire burns in old and heavy fuel, fire crews and air attack are continuing to work diligently to bring this fire to full containment. Happy Canyon Road is open. Figueroa Mountain Road is open. Los Padres National Forest Closure information and map are available at http://www.inciweb.org/. Los Padres National Forest Officials would like to remind forest visitors to be careful when traveling the Happy Canyon and Figueroa Mountain roads due to the continued use of fire equipment in the area. Significant Events: An EVACUATION ORDER continues for the Peachtree Community. An EVACUATION WARNING remains in place for Happy Canyon Road north of Baseline Avenue, including ranches and residences between Lake Cachuma and McKinley Ridge. With continuing warm and dry conditions, active burning will continue throughout the day in the southeast and northeast areas of the fire. The fire remains in steep, rocky terrain with poor access. The continued poor accesss makes containment diffcult in the wilderness on the eastern flank. Downhill progression to the south and west established fire in the head of Peachtree Canyon and again threatens private lands and structures. Continued low relative humidity (single digit) and wind aligned with topography resulted in extreme fire behavior yesterday. Predicted weather over the next several days and into the weekend is for similar conditions. While the fire burns in old and heavy fuel, fire crews and air attack are continuing to work diligently to bring this fire to full containment. Current Situation: The Forest is evaluating additional closure areas. Two historic cabins at Santa Cruz and Bluff Camp have been wrapped for fire protection. Safety Message: Travelers using SR-154, please be cautious of firefighting equipment and personnel. In addition, with the re-opening of some areas of the forest, we want to remind forest visitors to watch for heavy equipment and crews working on the rehabilitation efforts. Additional Information: In light of the current weather conditions and fire behavior, smoke from the Zaca Fire may be visible over a wide area with occasional drift smoke as far away as Santa Barbara, Goleta or other areas of the county. Chaparral, 6 foot high and oak woodlands. Fuel moisture levels are extremely low, at levels normally seen in late summer. Division J on the SE side of the fire is burning in a mix of pine and chaparral. The fire continued steady progression through the night to the east in Divisions J and S pushed by winds and fueled by low humidity. Division T continued to hold on the McKinley fuelbreak at the head of Peachtree Canyon. The fire made significant runs with torching and spotting to the northeast toward Mission Pines Basin. The Forest is evaluating the closure of additional areas. The evacuation of Peachtree remains in effect. Historic cabins at Santa Cruz and Bluff Camp were wrapped for fire protection. Divisions T, J and I are the priorities for the next operational period. Division U completed and will be monitored by air resources. Division T should be completed tonight with crews to hold and secure tomorrow. Division S continues improvemnt of indirect line on the Santa Cruz Jeep Trail. Division J completed line to drainage in section 12 west of Mission Pine Camp. Ability to continue direct line efforts in J will be evaluated. Fire will continue to spread to the south and east with a forward spread of 1.5 to 2.0 miles per day to Mission Pine Ridge with the high probability of significantly increasing in size. The remote access and rugged terrain will require a long term strategy that will be implemented over a 5 to 6 week period. part ofthe Elk Complex fire incident....Sikorsky Sky Crane S-64 CH-64 Helicopter fire fighting Happy Camp Elk Complex happy camp elk complex 07/23/07 Close up of Sikorsky Sky Crane taking on water from the Klamath River in Happy Camp CA 96039. The water was being dropped on the Little Grider Fire north of town. The fire was part ofthe Elk Complex fire incident. UPDATE: BUTTE COUNTY, Calif. -- Driver trapped inside for about three hours rescued. Driver Robert Sylvester, 45, of Chico, was listed in good condition at Enloe Medical Center in Chico as of early afternoon. Meanwhile, officials from the state Occupational Safety and Health Administration were at the scene looking into the cause of the accident. Per California Highway Patrol incident was reported at about 7:18 a.m.
injuries, and one patient left inside of a FedEx truck. FedEx driver is alert and talking with rescuers at this time. He's on his way to Enloe with severe lower limb injuries. heavy traffic, not sure if now open. Incident being worked concurrent with nearby vegetation fire, and vehicular accident involving Cal Trans vehicle. BUTTE COUNTY, Calif. -- Support beams for a bridge project along Highway 170 north of Oroville collapsed Tuesday morning, crushing a FedEx truck and trapping the driver inside.The bridge is being built along a stretch of highway at the junction of Highway 149.The California Highway Patrol said incident was reported at about 7:18 a.m. The California Department of Transportation said some steel false work used to support the project fell down on the road below, trapping the delivery truck.The driver of the truck was alive and was seen talking to rescue workers. As of 9:30 a.m., dozens of rescuers were at the scene, with many climbing up on the truck in an attempt to help the driver.Officials said each of the steel beams sitting on the truck weighs several thousand pounds.Authorities said a construction worker was on top of the false work at the time of the collapse. 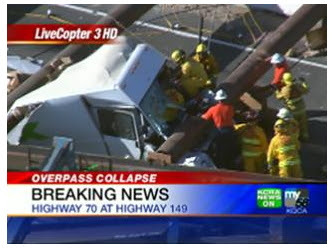 He rode the steel down to the ground and was injured, but officials said he will likely survive.A secondary crash involving a Caltrans truck took place a short distance south of the bridge collapse. It was not clear if anyone was injured in that incident. Location: CAMERON PARK - East of Cameron Park Drive and north of Highway 50, on Palmer Drive and Loma Drive. There are currently nine engines and three fire crews at the scene. The Sacramento Sierra Chapter of the American Red Cross has established an evacuation center at Ponderosa High School, 3661 Ponderosa Road in Shingle Springs. Per Marty Hackett, El Dorado Co. OES: Wildland fire is threatening the following communities and a mandatory evacaution order is in place: Many Oaks Lane, Soap Plant Lane, Lily Lane, Whispering Pines, Cross Wood Dr., Calderwood Rd., Sandlewood Ln. Shelter is located at Ponderosa High School, on Ponderosa Rd. ZACA FIRE - Fire Perimeters keep growing - A penny wise and a pound foolish..
Forest Service - A penny wise and a pound foolish?.. The 37,350 acre ZACA Fire Perimeters keep growing and containment has gone down is this fire getting ready to explode? Rumors of a huge 25,000 acre backfire being planned? Is Santa Barbra county in trouble? If weather patterns worsen Santa Barbara could be facing evacuations, structures lost and a horrific firestorm. An evacuation warning has residents in the Painted Cave Area on alert tonight due to the Zaca Fire. But it's not the first time the Painted Cave area has been on alert. On June 27, 1990, one of the most destructive fires in Central Coast history started in a residential area in the mountains above Santa Barbara. The Painted Cave fire burned nearly 5,000 acres, destroyed 400 homes and killed one woman. The fire caused more than 270 million dollars in damages. And did an attempt at cost cutting lead to this current situation on the ZACA? And why one million homes are now threatened a month into the uncontrolled Zaca Fire? 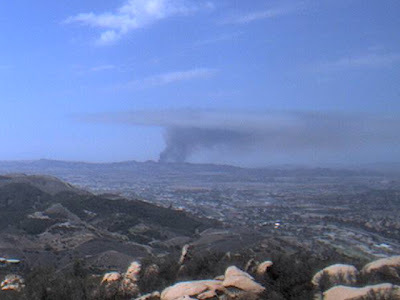 Fire crews say this blaze has the potential to burn all the way to the Ventura County line. This could mean mass evacuation of citizens and large numbers of structures lost costing hundreds of millions of dollars in property loss and thousands of lives disrupted. This fire was being heavily demobilized with cost cutting in mind when she blew out on the late afternoon July 28th growing around 1500 to 2000 acres in just a few hours setting back the containment numbers from 80% to 60% and causing a re-mobilization of resources some of which were being demobilized just hours earlier. Aircraft, Engines, Dozers, Graders, Water tenders, camp kitchens, tents, toilets and showers everything that was deemed too expensive now being called back at added expense. The remote access and rugged terrain is requiring a long term strategy that will be implemented over a 5 to 6 week period lets hope the U.S. Forest Service will not be penny wise and a pound foolish..
A Quebec forest firefighter killed in a helicopter crash north of Fort McMurray (ALBERTA) on the weekend has been identified. Patrick Dominic Watters-Michaud, 22, of Quebec City, was a wildland firefighter employed seasonally with Alberta Sustainable Resource Development. He was a passenger on the A-Star BA Helicopter operated by Phoenix Heli-Flight out of Fort McMurray. The pilot and three other firefighters were treated in hospital for non-life-threatening injuries. The pilot and one firefighter have been released from hospital, two others remain in hospital care. The forest firefighter killed in a helicopter crash was identified today as Patrick Dominic Watters-Michaud. The 22-year-old came from Quebec City to work in Alberta as a wildland firefighter, a seasonal job through Alberta Sustainable Resource Development. On Sunday, Watters-Michaud was part of a rapid response team on stand-by near Johnson Lake, 120 kilometres northeast of Fort McMurray. The crew was on its way back to Fort McMurray at about 8 p.m. when the helicopter crashed. Doug Knight, president of the Alberta Uni"
Happy Canyon Road above Baseline Road is within the Evacuation Warning area. Due to the presence of fire-related traffic, public travel is discouraged in this area. The road is open to residents. Figueroa Mountain Road is open. Please drively slowly and watch for fire equipment. Due to the presence of heavy equipment working in the area, East Camino Cielo Road between Painted Cave Road and Gibraltar Road is closed to general public traffic. Bulldozers are enhancing an existing fuelbreak that parallels East Camino Cielo. This work is being done as a longterm contingency should the Zaca Fire advance in that direction. 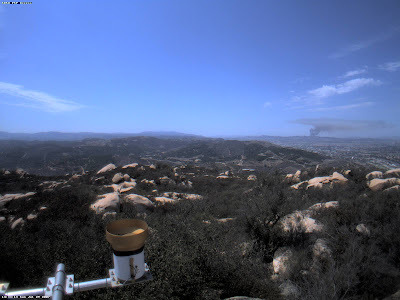 The Zaca Fire is several miles away and does not pose an immediate threat to the area. Similary contingency lines are being placed as a precautionary measure at strategic locations around Los Padres National Forest. Travelers on Paradise Road off Highway 154 should drive at a safe speed and watch for heavy equipment. A helibase is being developed on Rancho San Fernando Rey off Paradise Road to support the Zaca Fire. Portions of Los Padres National Forest in the general vicinity of the Zaca Fire are closed to public entry for public and firefighter safety. Los Padres National Forest Officials have reduced the forest closure. The updated closure order and map are available at http://www.inciweb.org/. The Los Padres National Forest Officials would like to remind forest visitors to be careful when traveling the Happy Canyon and Figueroa Mountain roads due to the continued use of fire equipment in the area. Significant Events: An EVACUATION ORDER has been issued for the Peachtree Community. An EVACUATION WARNING has been issued for Happy Canyon Road north of Baseline Avenue, including the ranches between Lake Cachuma and McKinley Ridge. With the current warming and drying trend, active burning continued throughout the day in a southeast direction. The fire remained along the McKinley Trail and did not firmly establish itself in the Peachtree drainage. The fire dropped down the Santa Cruz Peak and started to establish itself in the Black Canyon drainage. The fire moved approximately one mile south of Mission Pine Basin. Columns and drift smoke are likely to be seen throughout the Central Coast. While the fire burns in old and heavy fuel, fire crews and air attack are continuing to work diligently to bring this fire to full containment. Current Situation: The relative humidity tonight will be slightly higher, but recovery remains minimal at 30%. Tomorrow the relative humidities are expected to be, once again, in the single digits with warmer temperatures. Normal upslope winds in the afternoon changing to northwest winds in the evening with gusts up to 25 mph. 20 miles north west of Santa Barbara, Ca. Model 4 (6 ft) and oak woodlands. Fuel moisture levels are extremely low, at levels normally seen in late summer. Progression on the western edge of the fire slowed along the upper portion of the Peachtree drainage. However, the fire continued movement on the south and then to the east, further establishing itself in the wilderness with short range spotting and torching. The evacuation of Peachtree remains in effect. The Forest is evaluation closure of additional areas. Structure protection is in place for Peachtree and preparation is underway in case there is a need to use indirect line and burnout around the community. Opportunities to safely construct and secure direct line along the ridge above Peachtree is being evaluated. Direct line construction continues in Division J. Fire will continue to spread to the south and east with a forward spread of 1.5 to 2.0 miles per day. There is a continued threat to state responsibility areas. 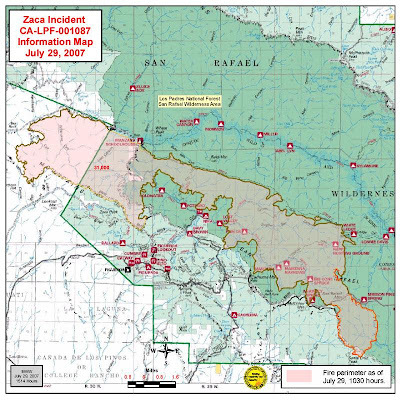 Expected containment date for the Zaca Fire has been extended to September 7, 2007. 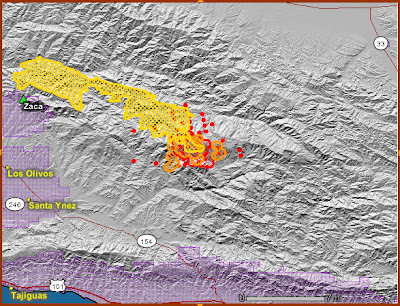 On July 28, 2007, the Zaca Fire moved out along the uncontained portion of the fire on the San Rafael Mountain ridge, and due to low humidity and high temperatures the fire grew more than 1500 acres. At this point the fire repositioned itself becoming terrain driven. It is burning in areas that are extremely steep, rugged and inaccessible. Because of this, firefighters are not able to build fire line directly adjacent to the perimeter of the fire. Indirect fire breaks must be constructed to contain the approaching fire. Firefighting tactics are currently underway, including the possibility of burn out operations as weather permits. A burnout is where firefighters use an existing or constructed fuel break and ignite a fire that will consume the fuel between the fire and the fuel break. While the fire continues to burn, smoke and ash could be present throughout the Central Coast. Please contact your local Health Department for smoke related health concerns. 18:37 Forward spread stopped, canceling third dozer and Tanker 80 and 81 released. A Cal Fire helicopter dumped water on a hot spot as it joined Tracy Fire Department crews Saturday in fighting a grass fire at a former landfill on Corral Hollow Road, just south of Interstate 580. The helicopter reloaded with water from the California Aqueduct to the north and was joined by two other fixed-wing air tankers. It's unknown how many acres burned." Significant Events: An EVACUATION ORDER has been issued for the Peachtree Community. An EVACUATION WARNING has been issued for Happy Canyon Road up to Baseline Avenue. With the current warming and drying trend, active burning continued throughout the night in the uncontained, southeast area of the fire. Approximately 1000 acres burned in a southeast direction since yesterday with areas burning out of the San Rafael Wilderness, including two spot fires. The relative humidity recovery overnight was very minimal, only reaching into the mid twenties. Active burning is predicted to continue today, as single digit relative humidities and temperatures into the mid 90s prevail in the fire area. Columns and drift smoke are likely to be seen throughout the Central Coast. While the fire burns in old and heavy fuel, fire crews and air attack are continuing to work diligently to bring this fire to full containment. Current Situation: The current warm and dry weather conditions are expected to continue through Monday and the fire is expected to continue actively burning. The fire has spotted across McKinley Peak and has moved out of the San Rafael Wilderness in some areas. Fire remained active through the night. Santa Barbara County evacuated the community of Peachtree. Structure protection initiated for Peachtree. Major effort will be to hold western flank and keep the fire from moving toward Peachtree. High potential for the fire to spread. The fire spread an additional 2,000 to 3,000 acres or more over the night. Full response with additional engines and aircraft orders. Update 1625: Fire has increased in size from 100 to 125 acres with 10 percent containment. Road closures still in effect. American Medical Response is responding to the incident for firefighter with smoke inhalation. Update: 1645: 119 acres invovled with 10 percent containment. 90 percent of the structure threat has been mitigated. American Red Cross has opened a voluntary evacuation center at Elsinor High School, located at 21800 Canyon Drive X Orange in Wildomar. TB 897 B4 American Red Cross has also set-up a canteening area outside the fire area for residents that voluntarily evacuated. Problems: High-tension powerlines in the area. Road closures on Scott Rd. between Sweetwater Canyon and Daily Road. Evacuation order was issued for the Peachtree Community, about 2 homes spread over a wide area of the Los Padres National Forest. An EVACUATION ORDER has been issued for the Peachtree Community. An EVACUATION WARNING has been issued for Happy Canyon Road up to Baseline Avenue. With the current warming and drying trend, active burning continued throughout the night in the uncontained, southeast area of the fire. Approximately 1000 acres burned in a southeast direction since yesterday with areas burning out of the San Rafael Wilderness, including two spot fires. The relative humidity recovery overnight was very minimal, only reaching into the mid twenties. Active burning is predicted to continue today, as single digit relative humidities and temperatures into the mid 90s prevail in the fire area. Columns and drift smoke are likely to be seen throughout the Central Coast. While the fire burns in old and heavy fuel, fire crews and air attack are continuing to work diligently to bring this fire to full containment. LEMOORE, Calif. — An apartment fire in California's Central Valley left five family members dead, including three children, authorities said. Firefighters early Saturday found the bodies of Michell Mattison and Derik Faubion, both 19, and their 2-month-old baby Hayden Allison Faubion in one of the apartments. The couple's niece and nephew, Lexus May Visnar, 4, and Ariel Nel Visnar, 2, also died in the fire. Investigators have not determined a cause. Police Chief Kim Morrell told the Fresno Bee that foul play was not suspected. Firefighters discovered the bodies after they put out the fire, which destroyed nine of the 23 apartments in the complex. The building had shingle roofs and plywood siding, said Ted Schlosser, the city's assistant fire chief. 'It didn't take it long to spread,' he said. 'The whole roof was fully engulfed when we got here.'" Firefighters responded to a fire located a half mile southeast of Petrolia Friday. The Chambers Fire was reported at 7:27 Friday evening and had burned approximately 40 acres of grass and brush. As of Saturday afternoon, the fire was 80 percent contained. Through the efforts of fire personnel from Cal Fire and the Honeydew, Petrolia and Telegraph Ridge volunteer fire departments, 20 structures were saved. One residence and one outbuilding were destroyed. No injuries have been reported and the cause of the fire is under investigation." InciWeb: Elk Complex Wildland Fire - 12,385 acres - 66% containment. Lower humidity yesterday afternoon allowed for improved burning conditions on the eastern flanks of the King Creek 2/Wingate/Titus fires. The three fires have burned together and are now one fire. Today, crews will continue burning with the assistance of aerial resources. Crews will also staff the Elk Fire after observing increased fire activity yesterday. Firefighters will continue patrolling and mopping up the Little Grider Fire. A remembrance ceremony was conducted yesterday morning to honor firefighters and camp employees who have perished on the Happy Camp Ranger District over the last twenty years. The ceremony was attended by 1,100 Firefighters, Forest Service personnel and Happy Camp area residents. Sources of info include: http://www.inciweb.org (including other fires) or the incident information office at (530) 841-4451. Visit http://www.fs.fed.us/r5/klamath/conditions/ for information on fire restrictions and local closures. Active fire behavior with isolated torching, creeping and rollout on steep slopes. Continued to secure line burned on previous days. Improved conditions yesterday allowed burn operations to continue on the eastern flank of King Creek 2/Wingate/Titus Fire. A small slop over occured on the Elk Fire yesterday. A memorial in remembrance for the fallen firefighters was conducted Saturday at dawn. Continue burn operation on the Wingate/Titus/King Creek 2 fire with interior aerial ignition operations. Evaluate futher burn operations in Branch IV. Secure the line burned in previous days. Brush roads in southern portion of Branch IV. Contain slop over on the northwest flank of the Elk Fire. Expect an increase in containment as direct strategy and burnout continues. A total of seventy-seven miles of fire line has been constructed to date. This includes twenty-eight miles of dozer line and forty-nine miles of handline and brushed roads. A six mile portion of the Klamath River will be used as a west flank containment line for the Wingate/Titus/King Creek 2 Fire. Fire acreage and containment: Of the thirty identified fires in Elk Complex, 25 fires are 100% contained. The remaining fires are as follows: Kings Creek 2/Wingate/Titus 8,420 acres-36% (increase in acreage due to burn operations); Elk 1,144 acres-96%; Hummingbird 80 acres-0%.